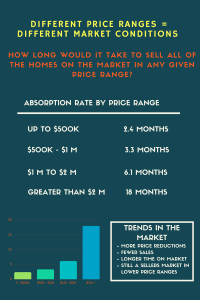 The Strength of the Market Depends Upon Price Range | Kearney Realty Co. In a recent market update I outlined how we are seeing more price reductions, fewer sales and that the market seems to be shifting away from a strong sellers market. However, there are still pockets in the Boulder County market where most of the houses are under contract. As I looked further I found that these “pockets” around the county all seemed to be in the lower price range of their community. The graphic below shows the absorption rate of the inventory throughout Boulder County in different price ranges. Think of it this way, if we froze the market and accepted no new listings but sales happened at the rate they have been happening over the past three months, how long would it take to sell all of the listings on realtor waldorf md. According to NAR (National Association of Realtors) a balanced market is 6 months. Anything less than that is a sellers market and more is a buyers market. So what we have is a sellers market under $1 million, a balanced market between $1 million and $2 million and a buyer’s market above $2 million. Another interesting graph that helps to tell the story of the market is below and it shows the number of price reductions in the market on a weekly basis over the past three years. 2015 and 2016 were markets characterized by multiple offers and above asking price sales. 2017 started out in much the same way but by the end of spring we were seeing some softening. One way to see this softening graphically is in the number of price reductions.